Hello there, today I have a card to share to send to a friend who is expecting. I thought the Clearly Besotted Tickle My Fancy Stamp Set would be perfect for it. I started off with a panel of white cardstock that was cut using the largest of the SSS Stitched Rectangle dies. 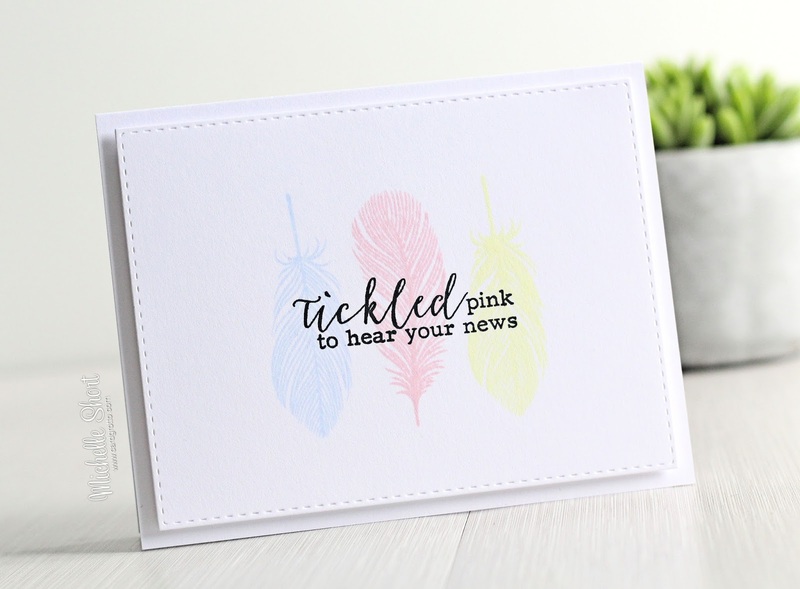 I then took the feather images from the stamp set and stamped these using pink, yellow and blue inks. The sentiment, from the same set, was stamped on top with black ink. The panel was adhered to a white A2 card base with foam sheet. To finish off, I went over the feathers using the clear Wink of Stella brush pen. A very simple card but I think it turned out quite pretty. Thank you so much for visiting me today. I hope you are all well, wishing you a great weekend! Aw, this is SO pretty and really effective. It says everything you need it to say, but in such a wonderful way. Great card Michelle! What a beautiful CAS card! Love the sentiment as it's perfect with the image and colors. So perfectly clean and simple. I love it.